Bulldog shovels are very much a British brand. Contractors want tools they can reply upon to get the job done. Working in heavy and demanding situations requires rugged tools that can stand the pace. Bulldog shovels have a reputation for quality going back 230 years. Based in Wigan, the craftsmen still maintain the same high standards that have been handed done through the generations. 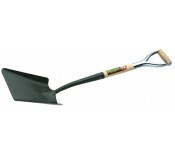 Our Bulldog shovel range has a great array of construction digging tools. The wooden shaft tools have American Ash handles that are hand turned in the Bulldog workshop, stained and varnished for weather protection. The all metal shovels are solid forged from one piece of steel to give maximum strength and the powerlite range are the ultimate in strength, with fibreglass shafts. Shafts on all products are buried deep into the socket for added strength. Our range of Bulldog shovels includes the taper and square mouth shovels, normally used for general purpose digging and shovelling. A cable laying and trenching shovel, these shovels are sometimes referred to as a "one-way" and "two-way" shovel respectively. A grafting tool, this shovel has a narrow blade design which allows this grafting tool to dig out trenches and material in manageable amounts. The final shovel in our Bulldog range is the newcastle draining tool which has a narrow blade design which allows this tool to dig drainage trenches without taking too much material. If you would like any further information regarding our Bulldog shovels, please do not hesitate to contact our experinced sales team.